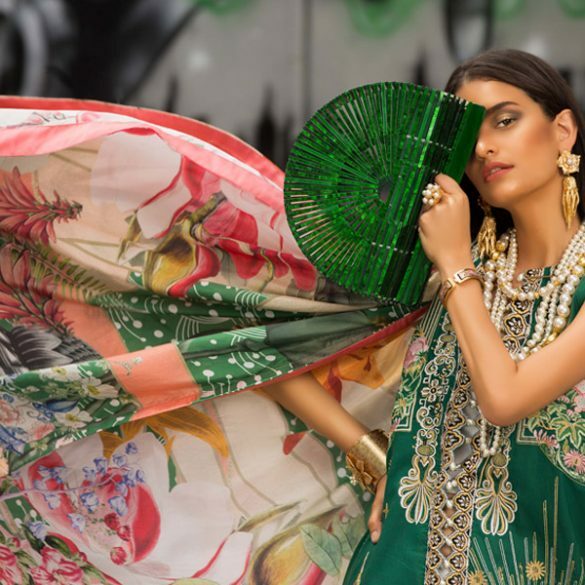 With three booming outlets in Karachi and Dubai and a fourth one launching next month in Abu Dhabi, Brands Just Pret (BJP) is no ordinary multi-label store. Under the leadership of the business savy and creatively charged young team of Hadi Anwar, Hasaah Hadi, and Somaya Adnan, BJP has established itself as much more than a straight forward multi-brand outlet, in fact it is a veritable fashion institute responsible for scouting and introducing fresh new talent into the industry fold. We had the distinct pleasure of chatting with the wonderful team about how it all started, day to day dynamics, and the exciting road ahead. Q) Brands Just Pret entered the fashion retail market at a time when the concept of multi-label stores had already been firmly established, what convinced you collectively that there was a gap to fill? How did you envision BJP to be different from existing multi-label stores? Agreed; the multi brand stores concept was firmly established and hence it required a certain element of innovation to identify and fill gaps. There was a six month study performed by a professional firm and a series of interviews were conducted with fashion designers to understand the challenges they faced when dealing with Multi Brand Stores. Time and effort was invested and based on the gaps highlighted in the studies performed and the “Opportunity Report” delivered to us, BRANDS Just Pret was formed. Today, when we look back and see the amount of multi brand stores cropping up, we feel that the time and effort we invested was much needed before we launched BRANDS Just Pret in Dolmen Mall Clifton in December 2011. Q) Brands Just Pret has an outlook of an extremely professionally run venture, how would you describe the different roles played by each of you (Hadi, Hasaah, and Somaya)? Who would you say has the toughest part to play? Are there ever arguments or disagreements that would be expected in any creative process? How are these resolved? We are an extremely approachable team; we listen carefully, we understand and humbly look people directly in the eye when responding. We have a strong belief that no business can run successfully unless the active partners bring and add a certain niche value to it. All three of us with our varied background and experiences bring a different flavour and expertise to BRANDS Just Pret and are Subject Matter Experts (SME) within our areas of discipline. We have ownership of our divisions and hence we are responsible and accountable for how we perform. Working extremely closely with each other always helps and as they say, “two minds are better than one”, no decision is made unless it is discussed between the management team, and this is how we support each other to resolve challenges. Everyone thinks differently and the positive aspect of having disagreements demonstrates that one is thinking; all challenges, innovative strategies and investments are discussed between us and then a joint decision is make after evaluating the pros & cons and rationale behind it. Sometimes having an odd number in the team always helps to resolve challenges in a democratic way. Q) Retails are paying increasing attention to the interior and design layout of their stores. Is there a distinct layout that you kept in mind and that is common to all your outlets? Retail outlets and how they are designed play an extremely important role in the retail industry. There is a whole science behind understanding how a customer enters the store, browses the products, interacts with the staff and then reaches the payment counter. We work with one retail specialist architect who understands our business model, our revenue generation streams and hence designs our stores keeping in the mind scalability and flexibility all at the same time. Working with one architect ensures that we have one consistent theme running across all our stores. However that said, one learns from past experiences and hence every new store we launch, we personally feel that it is better than the previous one. Q) Brands Just Pret has had rapid growth with the opening of four standalone stores; two in Karachi and two in the UAE within the span two years, an optimistic step to say the least. What was the thought process behind this fast paced expansion? We are four months away from BRANDS Just Pret’s second anniversary, showing our commitment to the fashion industry. We strongly believe that no business will expand if it is not profitable. If the foundation of one’s business is strong and the operations are under control, there is no limit on how much one can expand in the fashion retail industry. Currently, we are the fastest growing Multi Brand Store of Pakistan, the only one with two international outlets and we plan to maintain the momentum going forward. Some people like this, most people around us don’t want to accept it. Yes, the growth has been extremely aggressive but at the same time we have grown in a focused and controlled manner. Having the management team in two geographic locations and links within the Middle East certainly helped our expansion. Q) Additionally you are now in the process of franchising BJP, in what cities would you like to see the label developed and where do you feel lies the most potential for what BJP has to offer? After opening four stores in a short span of time, we would now like to pass the opportunity to entrepreneurs looking to enter the fashion industry. As our processes and systems have matured over time, we have become more successful with managing profitable multi brand stores, and hence can offer this to others who share a similar passion to ours, and are looking to invest their time in something we have built with a lot of hard work and dediction. As they say, “why reinvent the wheel?” It is always beneficial to be a part of a bigger, stronger brand with a supportive and professional team behind it. Just because we focus on being chic, trendy and affordable, there is no limit to where we can open our stores within Pakistan. That said, we are extremely choosy in deciding who we bring on as our future business partners. Interested entrepreneurs can send us an email at Franchising@BrandsJustPret.com to register their interest. Q) An important part of retail is customer service; would you like to share any interesting customer stories or experiences regarding their individual requests? One of the goals of BRANDS Just Pret is to have a Customer Service that is not just the best, but legendary. The idea was to keep the business simple and focus on ready-to-wear clothing i.e. you come, you buy, you leave. However a lot of times customers request for alterations and to ensure customer satisfaction, we provide this service to all our customers within Pakistan. We spend a lot of time talking to our customers and we were amazed to realize how many of our competitors don’t listen to their customers. Our sales staff is trained to make a customer and not just a sale. Q) Who is the target audience catered to by BJP? How would you describe the woman/girl who shops at your store? Tourists, fashionable social housewives, and busy working women looking for value for their hard earned money between ages 16 to 60. Our product is such that it caters to everyone. Q) Another striking feature of BJP is the relatively affordable price range. Is this a conscious effort in line with the BJP strategy? How do you manage to keep prices in check without compromising on quality? We wanted to be trendy and affordable from day one. Something not many designer stores were focusing on when we started. Constant feedback and close relationships with our designers helped achieve this challenge of keeping products available at low cost while maintaining high standards of quality. All our locations are at high footfall points focusing on impulsive buyers and this is exactly what we wanted from day one. High priced products would not do well in our stores and this is what was conveyed and advised to all our designers before they start stocking with us. Q) BJP participated in Pakistan Fashion Week London 3 last year, any plans to showcase in upcoming fashion weeks? What are the events planned for the rest of this year that you’d like to share with our readers? We have learnt that Fashion Weeks are for Designers to showcase their products and for buyers to buy their collections. We participated in PFW 3 in London because we wanted to take our designers in front of an international audience for the first time. It was an extremely valuable experience and we would love to do it again. However right now our focus is on hosting in-store events. One of the events currently underway is a 7 day Sale across all our stores where we are offering our customers up to 50% off on in-store products. Stay tuned for Part II of our interview with the BJP Team coming up soon where we learn more about their designers and collections. Meanwhile make sure you don’t miss out on their ongoing Mega Sale with discounts up to 50% on stocks at all their outlets! Shutterbug: A 'Sana Salman' Bride Across the Border! Trend Alert: Fall'13 Jewelry Trends! Interview: Sadaf Fawad Khan To Debut Her Bridal Collection In Karachi! Interview: Up Close & Personal with Saira Shakira! Interviews: An Exclusive Look At Deepak Perwani’s “Gold Dust” Collection! Interviews: Chit Chat with Sadaf Fawad Khan On Her #PLBW17 Debut Bridal Collection!